After the Texas Legislature created Lampasas County in 1856, official business of the county was conducted from a variety of spaces and buildings. Land for the Courthouse Square was set aside when the town of Lampasas was platted in the 1850s. In 1882, the Gulf, Colorado and Santa Fe Railroad extended their tracks to the county seat, bringing significant growth and prosperity to the area. In 1883, the Commissioners Court, with County Judge W.P. Beall presiding, hired Waco architect Wesley Clark Dodson, to design the new courthouse. The building contractor (Kane Brothers) and the stone contractors (T. Lovell and Company) executed Dodson's plan, completing the building in 1884. 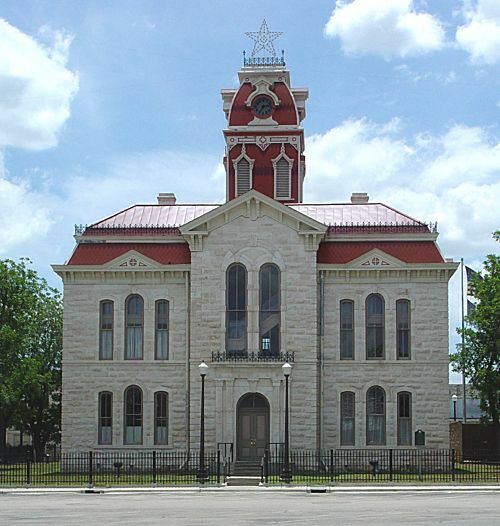 Reflecting the influences of the Second Empire and Italianate styles of architecture, the Lampasas County Courthouse features a central clock tower, arched windows and a Mansard roof. In 1884, the Commissioners Court authorized the city to place a Seth Thomas clock in the tower. Since its construction, the courthouse has been a focal point for city and county activities, including local festivals. Floods in 1936 and 1957 damaged the building, requiring repair and reconstruction. Today, the stately Lampasas County Courthouse remains an outstanding example of the golden era of courthouse construction in the state. It continues to serve as an important symbol of the county's growth and development and as an influence on the historic character of the county seat.